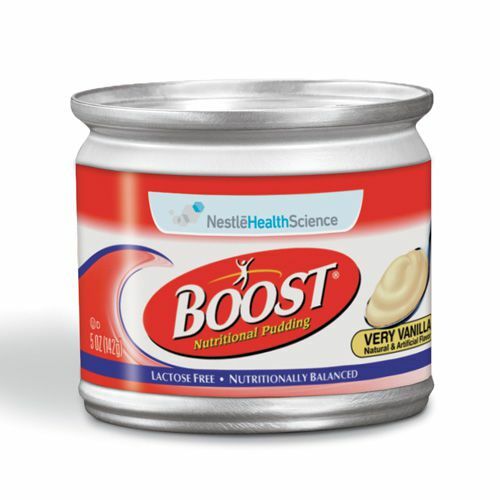 The Nestle Boost Nutritional Chocolate Ready to Use Pudding 5oz Each, Model #9460300, is anchored in advanced science and research. Nestle Healthcare Nutrition offers nutritional solutions for people with specific dietary needs related to illness, disease states or the special challenges of different life stages. The Nestle Boost Nutritional Chocolate Ready to Use Pudding 5oz Each provides 240 calories, 7 grams of protein and 24 vitamins and minerals for a nutritious snack. Great for diets that restrict fluids or require increased calories or protein. Available in Very Vanilla and Chocolate flavors.